SAN DIEGO — Months removed from the tragic sailboat crash that occurred during the annual Newport-to-Ensenada Race last April, sailors and boaters have been speculating about what caused the sinking of the 37-foot sailboat Aegean. All four sailors aboard perished in the incident, and many questions regarding what led to the accident the night of April 28 remained unanswered. Months later, an independent review board organized by US Sailing concluded that the boat crashed against the rocks of Coronado del Norte island approximately 10 miles from Mexico’s shoreline. Despite the findings, boaters and others have been speculating about whether or not another vessel collided with Aegean, since the original findings of the boat were tiny fragmented pieces floating along the surface. That led many to think a high-speed crash could have been possible. With the Coast Guard’s investigation of the accident still open, two San Diego natives have been volunteering their time and effort to discover for themselves what happened to Aegean and its crew that night. San Diego Lifeguard dive team specialist Ed Harris and Xplore Offshore ocean rafting owner Russell Moore have completed three dives at the proposed crash site, with the first taking place May 2, four days after the vessel was lost. With Harris’ dive expertise and Moore’s knowledge of the area, the two worked together to try and locate the yacht, but the murky and unfavorable diving conditions wouldn’t allow for the team to get close enough to the rocks to inspect the area. “It took nearly four months for us to get the optimal diving conditions we were looking for to dive in the area,” Moore said, who regularly takes passengers on tours around the islands. 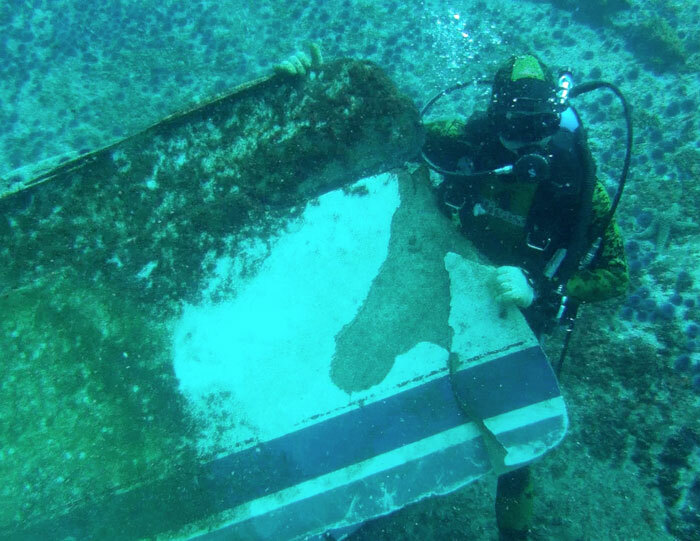 Finally, on Aug. 9, Harris and Moore were able to dive the site again, locating parts they believed to be Aegean. Moore documented the findings with his video camera, and relayed the information to the Coast Guard, who added the video and the team’s description to their report. The team then went back a third time Aug. 22, taking more detailed video and finding distinct pieces belonging to Aegean. The area where the wreckage was discovered is pounded by heavy surf most of the year, and the constant swell had ripped and twisted many parts of the boat, leaving bits of sail, cables, hoses and large chunks of structural fiberglass behind. The island’s geography is thin from north to south, about 500 feet in width and 1,000 feet in length. At night, the island could have been cloaked in the night sky, unable to be detected by the sailors approaching it. The deaths of the sailors were the first fatalities in six decades of Newport-to-Ensenada races. The four men were William Johnson Jr., 57, of Torrance; Kevin Rudolph, 53, of Manhattan Beach; Joseph Stewart, 64, of Bradenton, Fla.; and Theo Mavromatis, 49, of Redondo Beach.